Music has always grounded the listener is space and time, sung about places real and fantastic, anchoring whoever hears it to a particular moment when the song struck them just so. 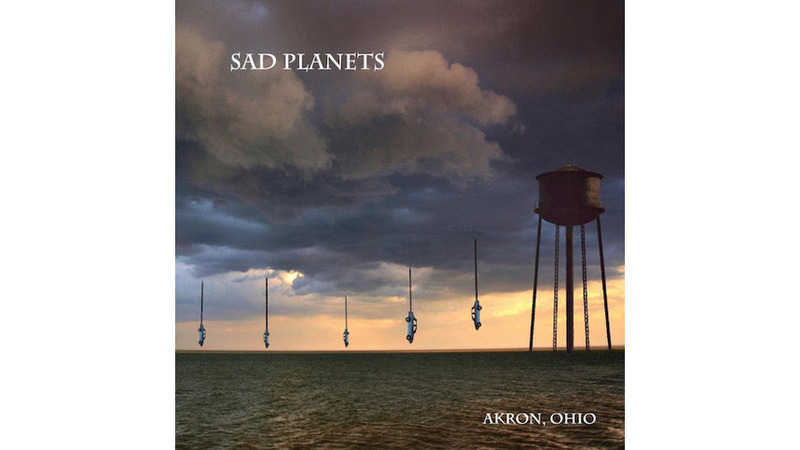 But with Sad Planets’ Akron, Ohio, Sweet Apple/Cobra Verde leader John Petkovic and The Black Keys’ Patrick Carney unite to give you the exact place that inspires the feeling, exploring the familiar and the new of their hometown across the breadth of their musical knowledge. “Just Landed” opens the album with a vintage U2 sensibility and a guitar solo that grinds like plane wheels touching the tarmac. It’s an easy landing that echoes with the latitude and longitude of Akron itself, the drive of the working-class country twang with a faint brush of that Midwestern punk sound. Later on, “Want You To Want You” reverses this sound, more The Replacements than Bono, and the results – with a fantastic synthesizer added to keep things contemporary – are not unlike the feeling of standing on an empty road and staring west, convinced you can see all the way to Nebraska, perhaps beyond. But the album doesn’t shy away from electronic flourishes and avant-garde sounds. “Not of This World” takes its musical cues from The Who with a hammering guitar line and lyrics spit like typewriter keys before opening into a slow wash of synthesizers. Meanwhile, “Bad Cells” distorts Petkovic voice to a narcotic sneer, but unlike “Not of This World,” the song wears out its welcome by the three-minute mark. “City Ghosts,” muffles his vocals and marches the guitar to a rain-slick noir sound, complete with a synthetic Theremin effect. It might seem corny, but it works. For all of the wild stretches of sound that the album plays with, it’s remarkably cohesive, threaded with the endless-highway drive that peaks on the penultimate track, “Heaven’s Devils.” It’s the album’s wildest, most rollicking track, rubber on road, racing the ghosts and the girls that have populated the album up until now. Carney’s drumming peaks here, deliciously threatening to thunder out of control. Take your headphones off after this track and you might just find that your hair has been blown back by the wind-sound of Petkovic’s layered guitars. Akron gave us Devo, Chrissie Hynde, The Cramps and Carney’s own uncle, the late saxophonist Ralph Carney, all musicians who took wildly different sounds from the streets of their industrial city. Sad Planets continues this trend, updating and paying homage to the city that binds them. With muddy vocals pleading, “Please say something…” “Disappearing,” leaves the listener homesick for a place they might never have been, but now, feels almost like home.